If towing is necessary, we recommend you to have it done by an authorized EQUUS dealer or a commercial tow truck service. If towing service is not available in an emergency, your vehicle may be temporarily towed using a cable or chain secured to the emergency towing hook under the front (or rear) of the vehicle. Use extreme caution when towing the vehicle. A driver must be in the vehicle to steer it and operate the brakes. Towing in this manner may be done only on hard-surfaced roads for a short distance and at low speeds. Also, the wheels, axles, power train, steering and brakes must all be in good condition. If the disabled vehicle cannot be moved, do not forcibly continue the towing. Contact an authorized EQUUS dealer or a commercial tow truck service for assistance. Emergency towing is not legal in all states. Contact an authorized EQUUS dealer and tow the vehicle. Place the transmission shift lever in N (Neutral). If the car is being towed with all four wheels on the ground, it can be towed only from the front. Be sure that the transmission is in neutral. Be sure the steering is unlocked by placing the Engine Start/Stop Button in the ACC position. 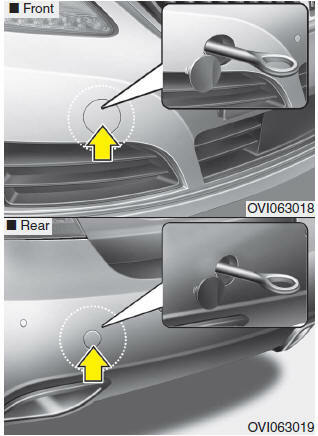 A driver must be in the towed vehicle to operate the steering and brakes. To avoid serious damage to the automatic transmission, limit the vehicle speed to 10 mph (15 km/h) and drive less than 1 mile (1.5 km) when towing. Before towing, check the automatic transmission for fluid leaks under your vehicle. If the automatic transmission fluid is leaking, flatbed equipment or a towing dolly must be used.